Support Education Employment for Vets (S.E.E4Vets) awarded a $5,000 grant to Rio Salado College to fund a new initiative designed to help veterans succeed in college. 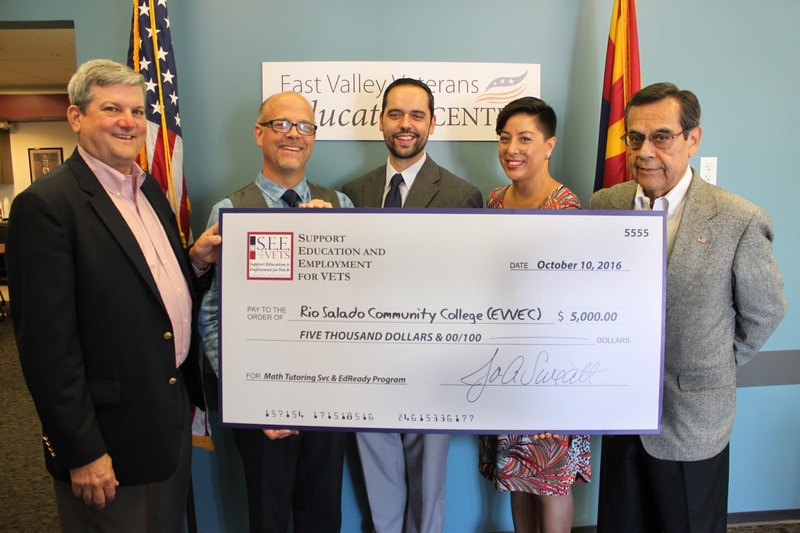 The grant will be used to fund on-site math tutors and tutoring programs at the East Valley Veterans Education Center (EVVEC) as part of a specialty program designed for veterans returning to college. The program will consist of two, eight-week courses – CPD150 Strategies for College Success and MAT 122 Intermediate Algebra, supplemented by on-site tutoring, math development programs and video conferencing. CPD150, will provide two weeks of developmental math curriculum designed to improve Accuplacer exam scores. On-site math tutoring will be available for 10 weeks to aid veteran students in the developmental math class. To ensure these veterans succeed with class requirements, MAT122 will be offered simultaneously at RSC-Luke Air Force Base and the EVVEC using video conferencing technology. Veterans will have an opportunity to enroll in the fall 2017 program soon! Contact the EVVEC for the latest details. Pictured left to right: S.E.E.4Vets Vice Chairman of the Board Vern "Rusty" Findley, Dean of Instruction & Community Development Greg Pereira, EVVEC Site Coordinator Troy Friedman, S.E.E.4Vets Executive Board Member Joanna Sweatt, S.E.E.4Vets Chairman of the Board Ray Torres.